I give this advice about your choice knowing it is your only choice. Forgive me if I sound over confident, uppity or even foolish. Jesus said “And as ye would that men should do to you, do ye also to them likewise.”(Lk 6:31) I would be grateful to any man who wanted to warn me of an eternal destiny in total suffering, torment or darkness. I don’t ask for anyone’s gratefulness, only their ears. The God of creation who will one day bring the history of man to its final chapter and judge the living and the dead has declared that all men are sinners, but more succinctly, all men have sinned. “For all have sinned, and come short of the glory of God.” (Ro 3:23) The simple question then is; what can we do about it. Don’t be surprised, but the most honest answer is; nothing at all! Man is completely incapable of dealing with sin and its consequences; that’s where God comes in and that’s why his dealing with man’s sin is called the grace of God. We create religions, moral codes or we labor under the false notion of an imaginary scale in the skies where our good behaviors out-weigh our worst behavior. God accepts none of these efforts but rather visits the earth as the Son of the Living God and takes our punishment himself through his death on the cross. Don’t worry you have not been led to some kind of entrapment, in fact as the previous verse indicates you have already been trapped and the price is far too high for anyone to get released. Death is bad enough but eternal death is beyond what any man wants to pay. God’s call is to receive life but it requires that you confess all your known sin and start a new life with Christ at the helm. It is called being “born again” and it is much more than a name by which to identify a group of Christians. It is a condition without which you cannot see life. How is it accomplished? The simplicity of the act of rebirth is this easy, so easy that it is often the reason it is overlooked or rejected. 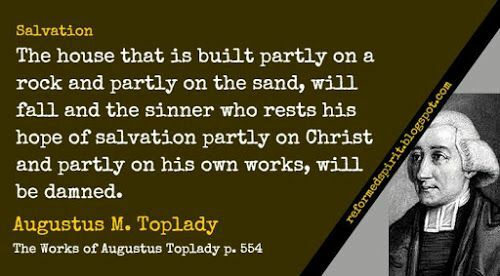 Understanding that Christ’s life was what paid for his salvation, Toplady wrote this summary about the costs. Forget the stock market report and don’t worry about the price of gold, there is not enough gold to buy your way into God’s Kingdom as the second stanza of the old hymn declares. In my hand no price I bring; simply to thy cross I cling. Could my tears forever flow, could my zeal no languor know. These for sin could not atone, Thou must save and Thou alone.